Back in the 1970’s passengers could park their cars right in front of the tiny Fort Lauderdale Airport terminal and board a plane by climbing outdoor stairs leading up to the aircraft. Times have certainly changed. With Fort Lauderdale’s population boom and a continued status as one of the most popular tourist destinations in the world, FLL serves over 23 million passengers annually. The good news is that this airport is easy to navigate and is ultra convenient to all who live here and visit. If you are considering air travel through Miami International Airport (MIA), it is located just 25 miles south of FLL. 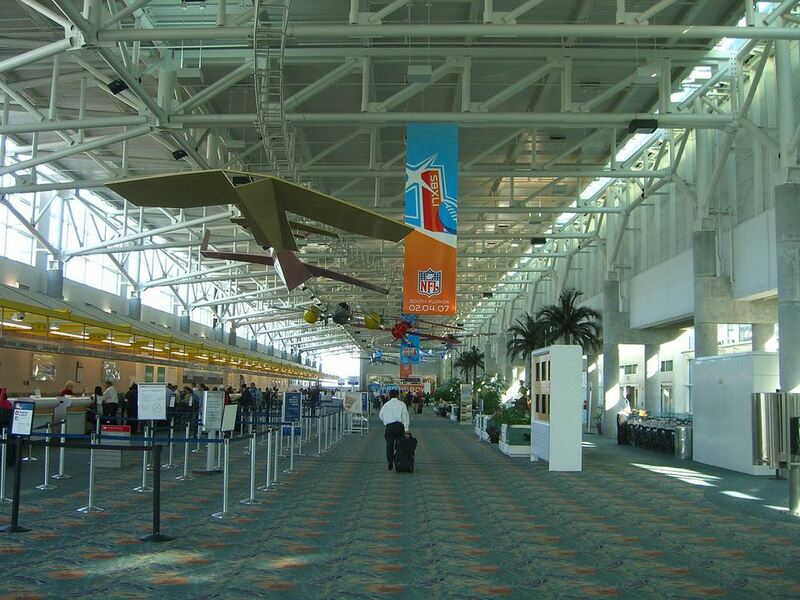 There are more than 30 airlines serving Fort Lauderdale/Hollywood International Airport. If you are picking someone up, check Flight Arrival times first. If you are leaving from FLL or dropping someone off, check Departures times before leaving home. Many airlines offer email notification services, letting you know if a flight is delayed or landing early. Check the airlines’ websites for details. This complete list of airlines and terminals will help make your visit to the airport easier and help you determine the best place to park. Fort Lauderdale/Hollywood International Airport is easily accessed via US1 (Federal Highway) or via Interstate 595. To access the airport from US1 from the north or south: the entrance ramps to the airport coming from the north on US1 are just south of I-595. From the south on US1, you will find the airport ramps just north of Griffin Road. To access the airport from I-95 or I-595: if you are traveling on I-95, follow the signs to I-595, located between Griffin Road and State Road 84. Head east on I-595 to US1 South and follow the signs to the airport. Airport security does not allow cars to park or wait at any terminal in Arrivals or Departures. There is, however, a convenient and well-lit Cell Phone Waiting area that can be accessed along Perimeter Road. It is conveniently situated close to Terminal 1 Arrivals, making it ultra easy to pick up your guests without circling around the airport. Please note that there are times when the Cell Phone Waiting Area is full, especially at night during the holidays. If you encounter a full lot, do not try to park behind another car in the lot. You will be asked by security to move and then must circle around the airport until a parking space becomes available or your guest has arrived. You can find directions to the Cell Phone Waiting Area on the website. Due to the airport’s Capital Improvement Plan, major construction is taking place on the south and east sides of the airport. Before leaving home for the airport, check the Airport Improvement and Renovations page for changes to traffic patterns. Located conveniently within the Terminal area of the airport is a 12,000 space parking complex. Parking options include hourly, daily, and valet parking. Parking garages can be accessed on the ground floor/arrivals level only. Valet Parking is available for all terminals and can be accessed in the Palm and Hibiscus garages. Economy parking is offered at $7.50 and is situated less than 4 miles from the airport. Shuttle service will take you to and from the Economy Lot to the airport. Courtesy shuttles are available on the Arrival level to take you between terminals, to Economy Parking and the Car Rental garage. Access the Rental Car Center on the ground floor of the terminal. The airport offers the option of 11 car rental companies on site. A free shuttle will take you to and from your terminal on the lower level only. It operates every 10 minutes every day, around the clock. Leave plenty of extra time when returning a rental car before flying. In addition to the Car Rental Center, there are a handful of car rental companies located outside of the airport grounds. Within the Car Rental Center at the airport, you can take a free shuttle from Bus Stop 7 to these off-site companies. You will find a taxi podium outside baggage claim at each of the four terminals. The airport offers many services for disabled passengers and others with special needs. In the event that you lose a personal item, proceed to the Lost and Found office in Terminal 1 Baggage Claim behind the elevators. Or you can complete an online form. You may reach Lost and Found by calling (954) 359-2247.